The time is officially here (according to the calendar, at least) and the season for dark lips has arrived. Fall is when I like to crack out my sultry reds more often, even though I wear them all year. Here are my top 5 of the moment. El tiempo ha llegado oficialmente (por lo menos en el calendario) y ya estamos en la temporada de labios obscuros. Es en otoño cuando me gusta sacar más seguido mis labiales obscuros, aunque los uso todo el año. Aquí les tengo mis 5 favoritos. We all know, it wouldn't be Fall without MAC Rebel. This has become iconic for many of us around here, the blue undertones make it perfect for a dark lipstick. If you're not very adventurous with really dark lips, something like MAC Party Line is the best option. This was my first dark red and I recommend it to anyone who has doubts on red lips, as I was too. If I'm not feeling red lips, I like to go for MAC Flat Out Fabulous. This isn't a very dark lipstick but I like to darken the edges of this matte fuchsia lipstick. (MAC Lipstick Swatches here). When things get even more sultry, my all-time favorite and most loved lipstick is Wine Not by Revlon. It is the darkest lipstick that I own, a matte wine-red that lasts for ages and looks killer on nights out. Speaking of lasting formulas, the Rimmel Show Off Matte Lip Velvet in Meteoric Matte is one of those that leaves a strong stain behind that wears off nicely. It's pigmented and has a very lightweight formula. Todos sabemos, no sería otoño sin Rebel de MAC. Este se ha convertido en el ícono para muchos de nosotros por aquí, los tonos azules lo hacen perfecto para un labial obscuro. Si no eres muy aventurada con labios tan profundos, algo como Party Line de MAC es la mejor opción. Este fue mi primer rojo intenso y lo recomiendo para cualquiera que tenga dudas de esos tonos, como yo lo estaba también. Si no ando en ánimos de rojo, me gusta optar por Flat Out Fabulous de MAC. No es un labial muy fuerte pero me gusta obscurecer las orillas de este labial fuchsia matte. (Pruebas de labiales MAC aquí). Cuando las cosas se ponen aún más dramáticas, mi favorito de todos los tiempos y más amado es Wine Not de Revlon. Es el labial más obscuro que tengo, un rojo-vino que dura por años y se ve padrísimo de noche. Y hablando de fórmulas que duran, Show Off Matte Lip Velvet en Meteoric Matte de Rimmel es uno de esos que dejan pinta mientras se desvanecen parejo. Está muy pigmentado y la fórmula es ligera. 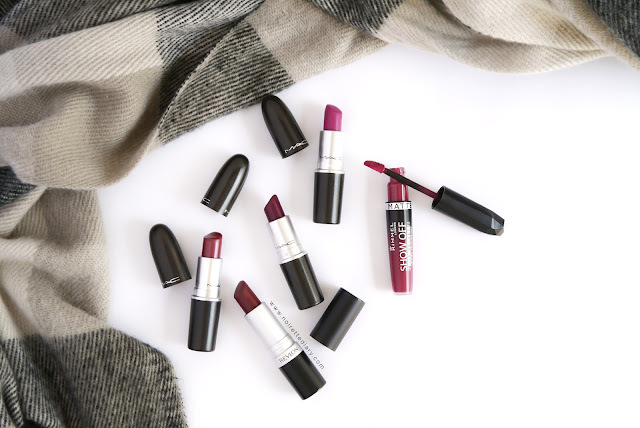 What are your favorite lipsticks for Fall? ¿Cuáles son sus labiales favoritos para el otoño?